Central Asia is one of the most complex places on the planet, rich in cultures, languages, and history – and especially with its legendary place on the old Silk Road. At the heart of that Silk Road is Uzbekistan, studded with UNESCO-listed treasures of Samarkand, Bukhara and beyond. 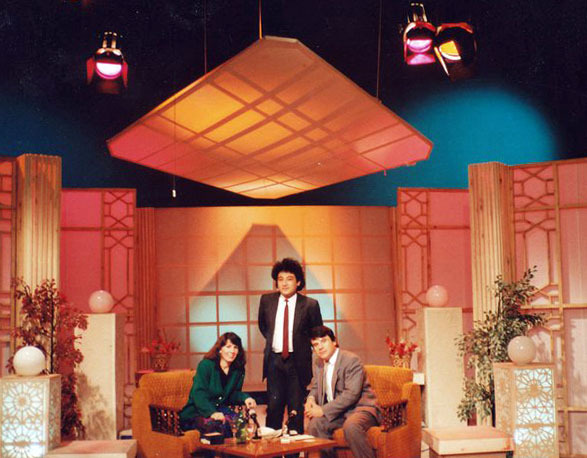 When I lived in Tashkent long ago and won an international award to work as a senior correspondent for Soviet TV – reporting in Russian to tens of millions of viewers – Uzbeks opened their hearts and homes to me. 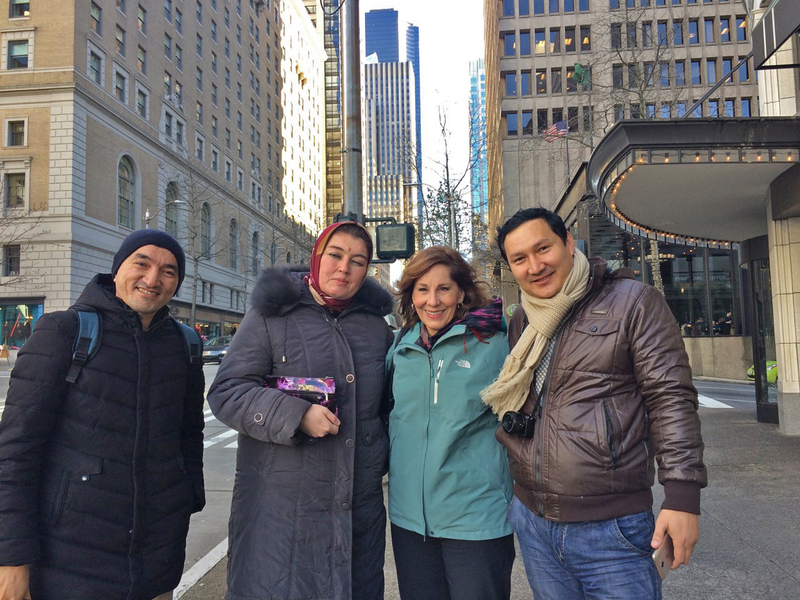 I simply cannot live up to Uzbeks’ hospitality and kindness – so when they show up in Seattle, I try to extend a welcoming hand, and hug. With a new Uzbek president in power, reforms are rampant – from business and currency to the new ease in traveling to Uzbekistan, with the process of obtaining a travel visa simplified and more streamlined. (Hurray!) There is a sense of optimism I’ve never before felt or seen for this country, and I lean into the hope of a bright future for my beloved Uzbekistan and dear Uzbek friends. 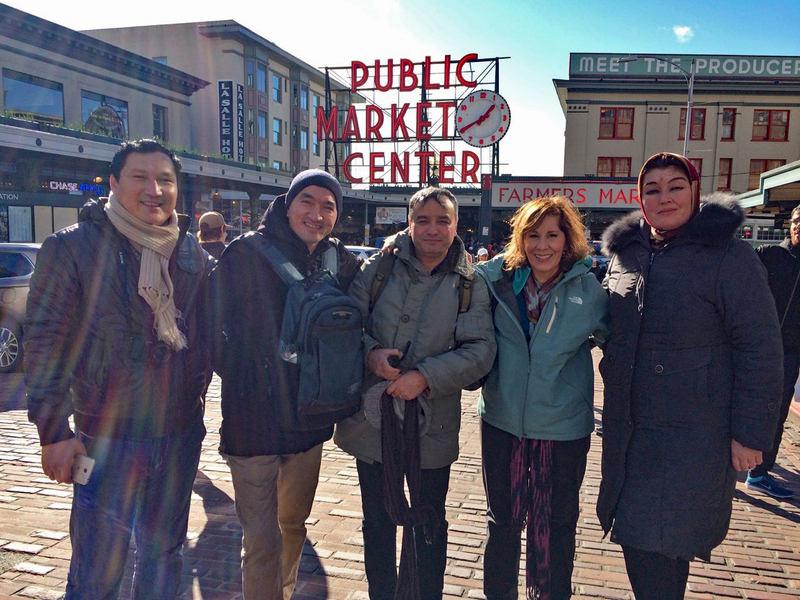 I was fortunate to be with Uzbek journalists from Tashkent visiting Seattle a few years ago – and again so lucky to be with a new Uzbek team visiting Seattle this week. 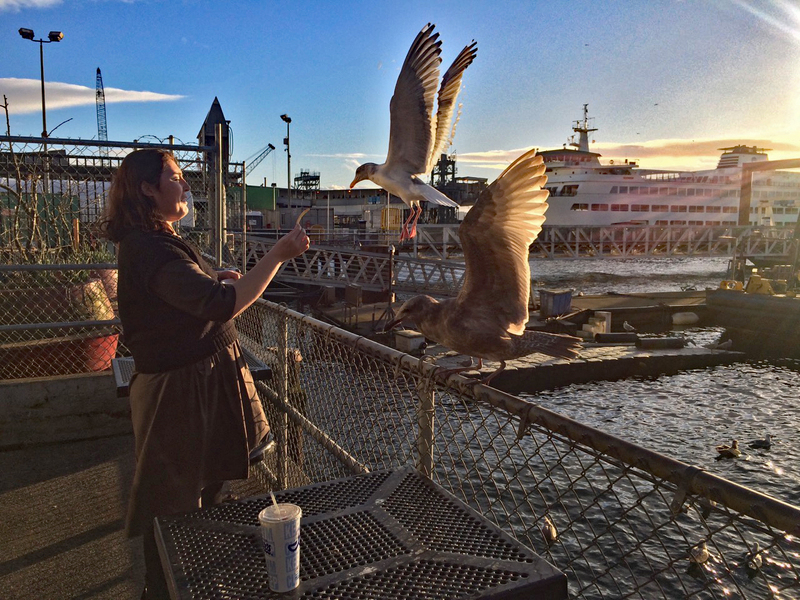 Here are just a few photos from our time today in Pike Place Market and the waterfront, on their last day in the U.S. before flying to South Korea. 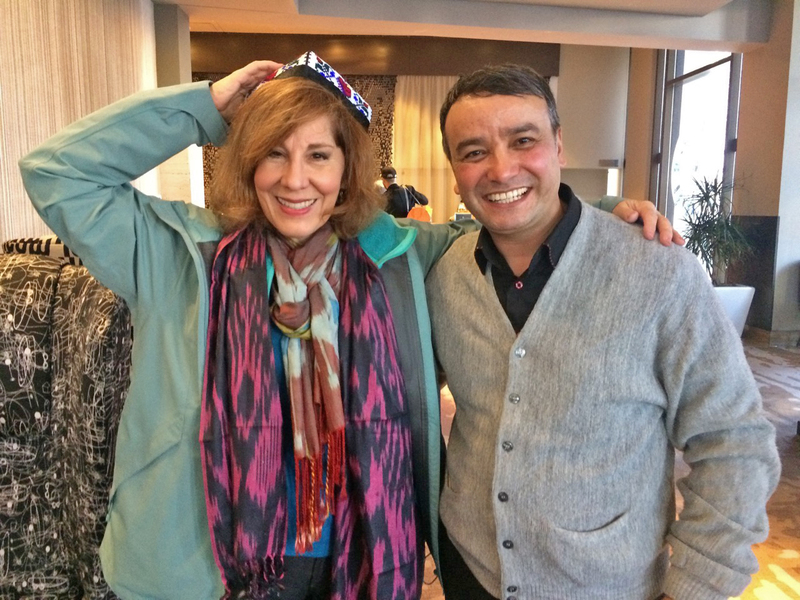 A’zam Obidov and I met a few years ago when an Uzbek TV news team from Tashkent came to Seattle to cover stories here, including Navruz, the springtime Muslim festival. It’s great meeting a new Uzbek team! A’zam is also a poet, with his latest astonishing words published in the book, “The Language of Birds,“ and translated into multiple languages. 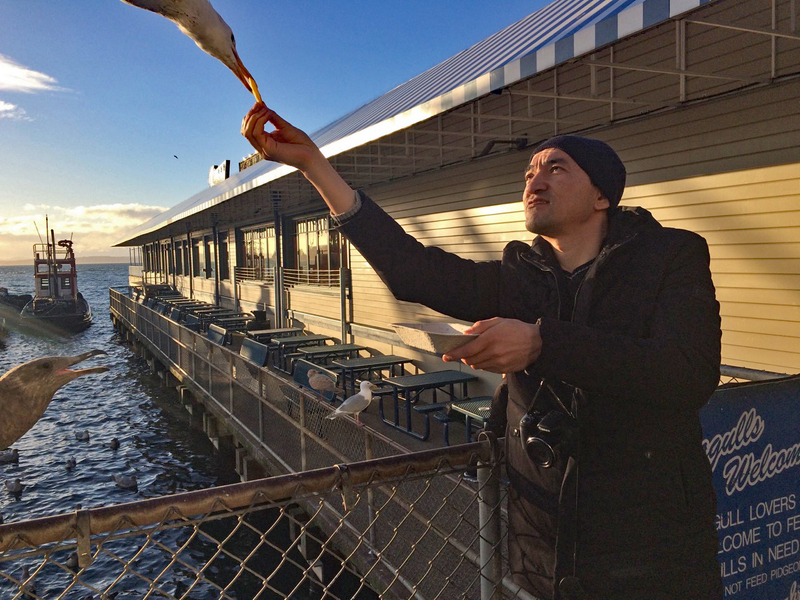 We were lucky the sun came out on this windy day in Seattle! We’re at the entrance to Pike Place Market, first opened in 1907; not much has changed in 111 years. In comparison, Tashkent has the 1,000-year-old (and maybe older) local and lively Chorsu Bazaar – brimming with everything under the sun, from apples to watermelons to batteries and TVs. A trio of buskars sings and performs the 1928 song, “In the Jailhouse Now” outside of the original Starbucks store in Pike Place Market. Despite the holiday crowds, we find “The Very First Tile” in Pike Place Market, one of 55,000 tiles. Each donor paid $35 in 1985 and 1986 to help save the Market from demolition. A’zam Obidov is at one of the most popular places in Seattle: the germy Gum Wall in Pike Place Market. In 2015, 1.75 TONS of gum were removed and the walls were cleaned. You would never know, looking at it today. Guess we Seattleites are addicted to recycling! 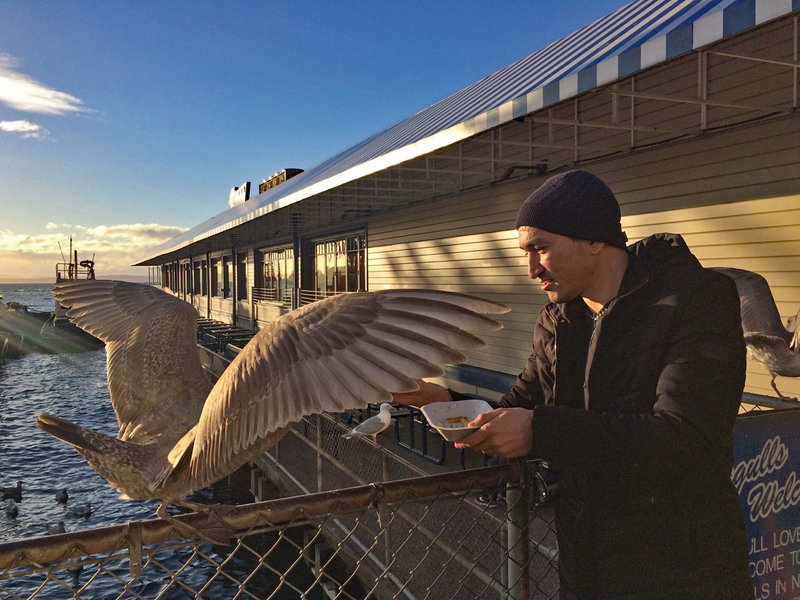 At Ivar’s Fish Bar, you ARE allowed to feed the bird, so Sanjar Said does! We are walking UPHILL back to the hotel, more than 5 miles of walking around Seattle – so fun! 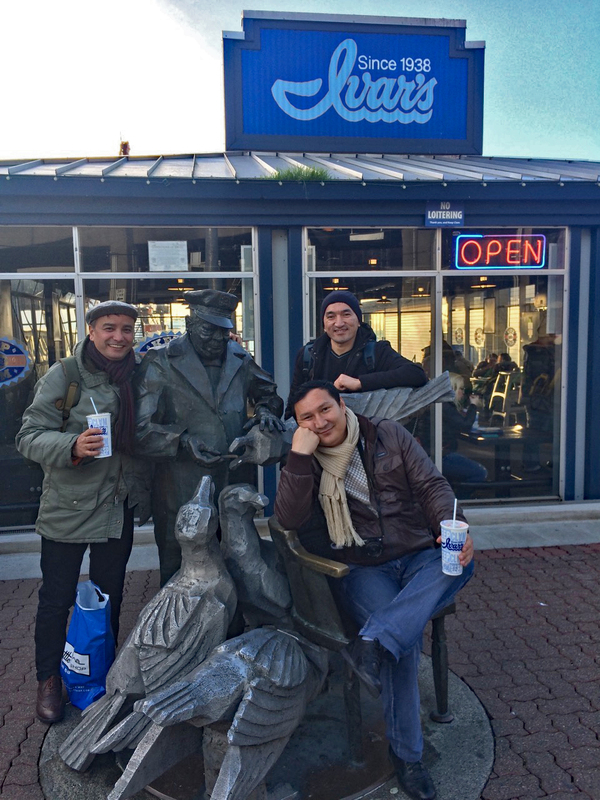 Such a wonderful day showing my beloved Seattle to my Uzbek friends. 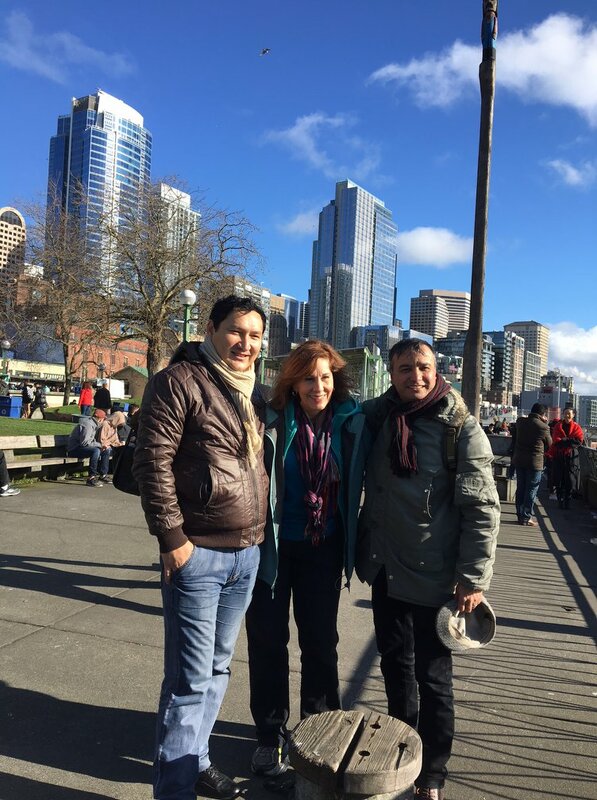 It’s my hope they’ll return soon, and that we can all live into the hope of continued strong relations between Seattle and Tashkent – in large part thanks to our 45-year friendship through the Seattle-Tashkent Sister City Association – and between the United States and Uzbekistan. All the best to you and your families! Tags: Central Asia, Helen Holter, journalism, journalists, Seattle-Tashkent Sister City Association, Silk Road, Tashkent, uzbekistan. Bookmark the permalink.